Learning objectives: Bowel dysfunction after treatment for rectal cancer is a common problem with a major impact on quality of life. Patients recovering after sphincter-preserving surgery often experience incontinence for flatus/faeces, frequent bowel movements, urgency and fragmentation of stools, often referred to as low anterior resection syndrome - or LARS. Within the last decades, several studies have investigated LARS, but unfortunately, most studies have used non-validated questionnaires, or used improper scales. Katrine J. Emmertsen is a surgical trainee in the Central Denmark Region. In September 2013 she defended her PhD thesis called 'Low Anterior Resection Syndrome - Bowel dysfunction after treatment for rectal cance'. 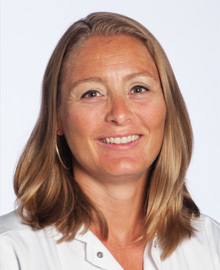 She is currently employed in the clinical work at the Surgical Department at Regional Hospital Randers, but continues her research at the Colorectal Surgical Department at Aarhus University Hospital. Her main areas of interest are function and quality of life after treatment for rectal cancer. She is the main contributor to the development of the LARS score – a new simple scoring system for evaluating bowel function after sphincter-preserving surgery for rectal cancer. This tool was published in 2012, and has now been translated and validated in several languages all over the world and is being used in both clinical practice and in large international research trials.